It’s been so long since the last update. I am so sorry! There are a few things going on that keep me a little busy. Anyway, I realized this site has been online a whole year already and I felt like celebrating. The site has received 16,784 visits in the past 12 months. There were 207 visits just yesterday. 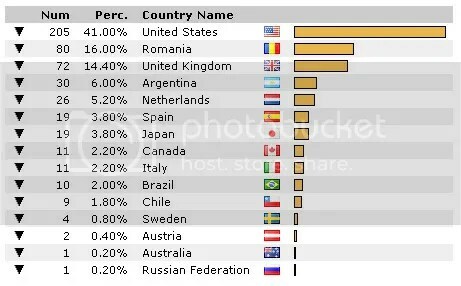 There have been visitors all over the world. From Dubai to Madagascar. The gallery now has 1,612 photographs, that have been viewed 40,578 times. So I think it’s safe to say that we are keeping Deborah’s memory alive quite nicely. And that brings me such joy! Thank you all for your comments and contributions. Lisa and Monica, thank you for the zillion uploads and your help dealing with the gallery issues and spammers. Another new feature in the gallery is private messaging. Registered users can now interact with other gallery users privately by sending and receiving messages. Next to the name of the user who uploads a photo, a link will appear with the text “send PM” . You can keep track of your sent and received messages through the link that appears on the side bar, right under the menu. 10 Responses to "First anniversary online." Judging by the pictures the new make over looks amazing, you did a great job! I love it! But the thing is I can’t seem to access the Gallery, the page doesn’t want to load, pretty weird! Do I need to have something installed or what am I doing wrong? Hope you can help me! Thank you! I love the new makeover – amazing! (A few minutes later)…like Larisa, I cannot gain access to the Gallery…I’ll keep on trying! *edit: It seems there was an upgrade of the gallery software that I didn’t do. I am not affected by it but maybe internet explorer users are… I will upgrade and see if that helps. Wish me luck cause last time I had to do this software upgrading thing I managed to lose all the comments and basically killed everything. Oh My. I think I’ll do ten backups of everything before attempting this again! Well, I did the upgrade and I managed not to ruin everything. I still don’t know what the problem was but I hope it is solved now. Let me know if you still have trouble accessing the site. Oh how stupid of me, I just found the changing theme button!!! So now it’s PERFECT I have the changed layout as well!!!! WOOHOO!!! Absolutely stunning makeover!!! You have artistic talent. Those themes in the gallery are amazing. much for using the photo I uploaded. And THANK YOU (times 10) for having this site for Deborah. We all love you for it. By the way, more magazine articles are coming to an inbox near you. Congratulations on your first anniversary!!!! i know it takes hard work to keep this site as great as it is and I applaud you! In one of Deborah’s obits, I think it was The San Francisco Chronicle, one of their critics wrote a piece praising Deborah, but saying that he thought she would not be remembered. You have proved him totally wrong. THANK YOU, THANK YOU, THANK YOU!! !